Helping a picky child get enough nutrients and learn to love different foods can be one of a parent’s most challenging tasks. It can also be a task that does not come intuitively even to the most devoted and loving parents. 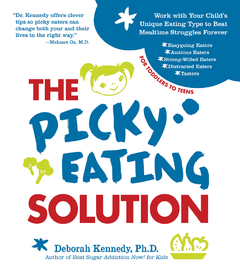 Dr. Deborah Kennedy is here to help withThe Picky Eating Solution: Work with Your Child’s Unique Eating Type to Beat Mealtime Struggles Forever. Her book breaks down strategies for helping picky eaters branch out while helping parents retain their sanity. It also divides picky eaters up into categories of behaviors to better target their specific needs. Do you have a child who eats ravenously when junk food is involved but won’t try a vegetable? Here’s what Dr. Kennedy says can help these junk food junkies. For snack time, you are feeding Katherine salted crackers. No matter how many you give her she wants more and gets very agitated and a bit crazed the more she eats. She screams like her world is ending when you say no more; it never seems as if she is satisfied. Katherine usually comes to a meal filled up on snacks, says that she is full and can’t eat another bite, but then screams for cookies and gummy fruit snacks within ten minutes of the table being cleared. Children who are intense and persistent can be very challenging to manage, especially if you are easygoing and lenient. Even the strongest parents have difficulty with these two temperaments, particularly if they have little understanding of theseinnate tendencies. Even though your Junk-Food Junkie may have been born high on the intensity and persistence scale, a Junk-Food Junkie is only created when he or she is exposed to junk food. Most children left to their own devices will become a Junk-Food Junkie because processed junk food is super-tasty and is made to be addictive. Parents who are indulgent or hands-off usually have Junk-Food Junkies in the house. The Junk-Food Junkie is an eating personality that a lot of us recognize. No sooner does he say he is full at dinner, he then asks for dessert or goes to the closet for cookies, chips, snack cake, or pudding. You may even recognize this eating personality in yourself. Junk food is addictive and many children, not to mention adults, have a difficult time regulating how much they’ve eaten. A lot of us have seen a mildmannered child turn into a screaming maniac over not being allowed junk food or being told they cannot have anymore. You know you have a Junk-Food Junkie if you are afraid of taking away your children’s treat or saying no to him. This eating personality will let his feelings be known in no uncertain terms. JunkFood Junkies crave, seek, and sneak junk and have withdrawals if not allowed it. Many Junk-Food Junkies have an issue with sugar control. Over time this unhealthy eating habit will likely lead to diabetes or heart disease, so it is important to reverse the high daily intake of sugar, solid fat, and salt in your child’s diet. When Junk-Food Junkies start the day with a sugar-filled breakfast of cereal, juice, and toast and jam or toaster cakes, the sugar level in their blood rises very quickly. Because what goes up must come down again, their blood sugar level will plummet, which will prompt them to reach for sugar to raise it again. This roller-coaster ride is not fun nor is it healthy for your child. Low blood sugar doesn’t feel good; children dealing with it get cranky, emotional, moody, and even shaky. Accepting that your child has a possible addiction or just plain cannot stop eating junk food will make it easier for you to understand and work with your JunkFood Junkie. Follow the strategies below to turn your Junk-Food Junkie around. To learn more about sugar and how to reverse your Junk-Food Junkie’s intake, check out my book Beat Sugar Addiction Now! for Kids. With a Junk-Food Junkie, you are dealing with an addict—or close to it. Your child can no more regulate her intake of junk food than most adults can. Keeping junk food out of the house, eating healthy snacks between meals, serving appropriate portions, and limiting treats to one a day are essential techniques that can help you manage your Junk-Food Junkie. If you have a sweet tooth, then you know how difficult it can be to resist the urge to indulge in cookies, candy, or cake when these foods are in your house. For your Junk-Food Junkie, it will be next to impossible to resist, which is why it is necessary to keep no more than one junk treat in the house at a time. A good tip, and one that will give your child a sense of control, is to take your Junk-Food Junkie shopping each week to pick his treat for the week. This weekly treat will serve as an enticement that you need to turn your Junk-Food Junkie around. “You can have your cookies after you finish your meal” or “Eat your fruit first and then you can have a treat for a snack” are two examples of eat-then-treat. If your child screams for more than one treat in the store or at home, take away her daily one-treat privilege until she can behave. Allow your Junk-Food Junkie ample time and space to act out if she feels crummy. Other techniques for helping your child cope are having her get exercise, go outside, and drink plenty of water. Your child needs to learn why it is so important to limit added sugar, salt, and solid fats in his diet and that he must eat the good, healthy stuff first before the junk. Start by teaching your child which foods and beverages are in the junk category and which are in the healthy food category. Your Junk-Food Junkie will most likely have a predisposition to turn to junk food when he gets stressed and will most likely always have a sweet tooth, especially if he has a relative with an addictive personality. Your goal is to teach your child that even though he has this propensity, he must always choose his food consciously and not let his taste buds lead the way. Provide healthy snacks, especially while you are limiting the amount of junk food in your child’s diet. The healthy snacks should give your child the protein and whole grains that she needs to keep her blood sugar level under control. The worst scenario for the Junk-Food Junkie is being super hungry. If your child gets to the point where she is screaming for a fix (candy, cookies, chips), you will be hard-pressed to calm her down enough to eat a healthy alternative. Teach your Junk-Food Junkie which foods are considered junk and why eating too much of them is unhealthy. Allow your child to pick out her treat for the week. Limit treats to one a day, after healthy food is eaten. Slowly reduce the Junk-Food Junkie’s intake of sugar. Allow for a detox period. Being super hungry is not a good state for the Junk-Food Junkie; provide healthy snacks between meals. For the past 20 years, pediatricians, nutritionists, and dieticians have advised parents to provide children with healthy food and regular meal times, but to let the child decide what and how much to eat. However, research and clinical practice is proving that approach is dangerously faulty and sets children up for substandard nutrition in the short-term and dysfunctional eating patterns–and illness–in the long-term. With The Picky Eating Solution you’ll:- Quickly and easily identify your child’s eating personality and learn how it impacts their interaction with food. – Gain new strategies for dealing with picky eaters based on new research and clinical practice. – Learn rules and approaches for resolving picky eating issues and ensure your kids are healthy and getting proper nutrition. The Picky Eating Solution brings a new approach to resolving meal-time struggles with your child. Take back control by implementing Dr. Deb’s easy eating strategies. Gain valuable insight and advice on how to deal with different picky eating personalities and get your child back to eating nutritious food on a consistent basis.